Are you ready to face the longest snake known to man?This snake sometimes posseses orange eyes which they say are hypnotic so when we meet this beast maybe you should hide your eyes.....well its up to you!Its called the reticulated python!This snake inhabits forest areas with lots of large foliage and water around.It is often found in large cities searching for a meal and is not afraid to wander near man ,in houses or around them!Such is the personality of this giant fearless!We will be traveling at night again this snake likes to move on the clear cooler nights here and we will surely run into one.But just how long is long?20 feet?30 feet?Maybe more?Who knows. 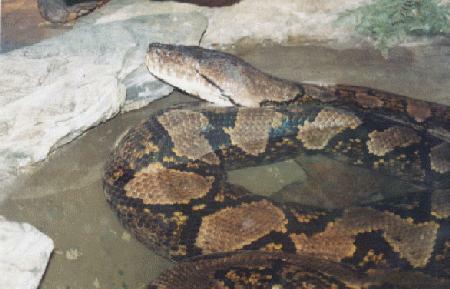 This snake has been reported to be 100 feet or longer!In 1971 Dr. Wayne F. King was going to collect a reticulated python in Celebes measuring 36 feet long!By the time officials got there however the natives burned the snake so it could not be brought back to the states alive.Remember that the reward for such a snake still exists from the New York Zoological society.Reports from Thailand say that they have several large retics that are fed in hopes of receiving a cash reward but so far they have failed to produce a 50 foot giant.But is that just one example?Are there giant retics in the wild that are bull killers?Maybe even elephant killers?Many of the reticulated pythons captured and measured in the 1800s measured between 20 feet and 27 feet.In 1844 one was killed in Pinang that measured slightly over 30 feet.One of 40 feet was found by a scientific expedition in Manila.These snakes are truly spectacular.One of the curiosities of the world.Every zoo would love to have a 50 foot specimen on display but there are non in captivity that large.But do they exist?And if so would you want it in captivity dwelling with man?In Bengkulu SW Sumatra two giant snakes were found probably breeding while excavating the land for homes.The operator of a nearby bulldozer decided to kill the animals.He fought over an hour one snake escaped the mammoth bulldozer the other snake which struggled mightily with the man made machine finally died.The female [probably] was feeding well to develop eggs obviously.When she was cut open the men found 4 human corpses in the stomach.Two were recently eaten beacause they were still in their shorts and trousers!This snake was measured and was 82 and 1/2 feet long!Can you escape a snake at that length?You had better watch your back on our treck into the forest.Here Ill hold the flashlight.The night air here is quite muggy.Although temps can be into the 60s sometimes, we are not that lucky, its about 82 degerees now.A light mist is falling with the humid air sticking on our faces and making our clothes feel icky and sticky.The sweat rolls from the brow because around every turn of our path could lie danger and possibly death.Tonight the moon is hidden by clouds and mysterious sounds break the quiet tension that rules the night.While we may not see them nor particularly hear them killers are hunting.And we are non inhabitants of the forest completely unprepared to deal with the unexpected nevertheless our task is set to find the largest python on eath!We slowly lurk through the forest shinning a light this way and that, knowing that the light only shines forward and that behind our backs lie total darkness, and who knows what.No one wants to look back.We decide to trail from our path into the forest floor away from any other mans foot steps into where only animals live.What animals we know not.The rain still falls only harder now hitting the plants all around us as our feet fall into what is now a moist soggy ground.Beneath our feet lie all sorts of plants and little creatures.The sounds still loom ,yet tranquil, still eary at the same time.A little further our feet sink in the mud, like quicksand its hard to move.The way is thicker now, trees and plants hitting our face tickle the nose and the occasional cob web makes us pull off peices of sticky spider silk from our lips.Darn!I just stepped in a pool of water! A loud hiss is heard.Quick shine the light over there!Nothing.A sound comes from behind and the light is shined, just as fast as the group huddles together, no one wanting to be alone in the back .Hmmm Nothing, as we turn the light catches a mysterious eye.Was that orange?The light back tracks.Yes L@@K at the size of that monster retic! Umm any one want to move over so I can get out of the water?SLOWLY!! Wow!What a night, now we have to find our way back out of the forest.Anyone keeping track? Oh you thought I was? Your kidding right?! HELP!!!!!!!!!!!!!!!!!!!!!!!!!!!! !